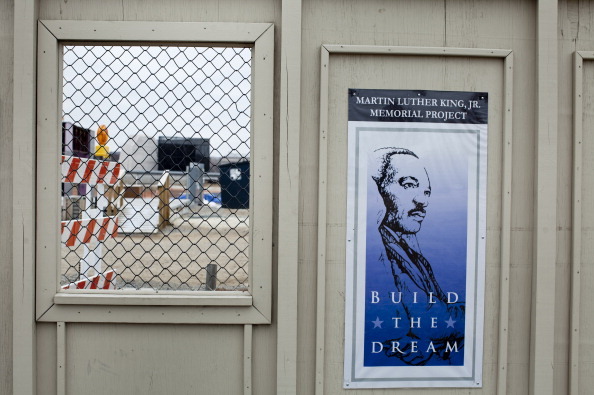 A view of the construction site for the new Martin Luther King Memorial on the National Mall. The dedication of the Martin Luther King, Jr. Memorial on the National Mall is less than two weeks away, but locals can get a preview of the monument ahead of the Aug. 28 dedication. DCist reports that “D.C. Residents’ Day,” originally only for District residents, is now open for all. Anyone who shows up between 8 a.m. and 10 p.m., Aug. 23 can see the memorial, regardless of their residency. 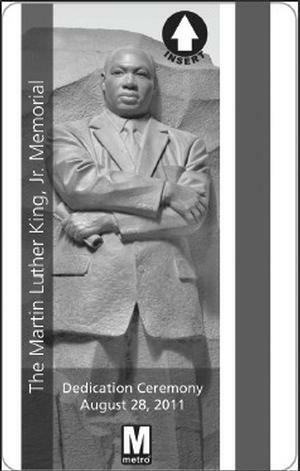 You can also mark the historic occasion by purchasing a commemorative Metro fare card. The memorial is the first on the Mall to honor an African American. 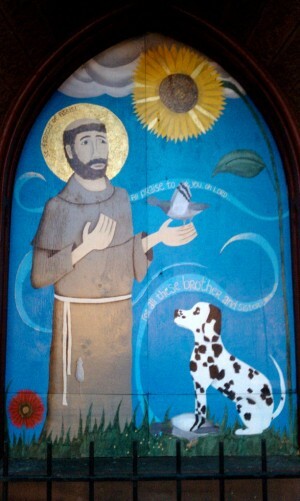 Luther Place's first mural: Saint Francis of Assisi-- and a congregant's Dalmatian! Where did the idea for this mural come from– what inspired it? I’ve been at Luther Place for two years; I came from inner-city Baltimore where I worked in neighborhood ministry…we did things with vacant lots, gardening and art. In Baltimore, we had the gift of many vacant lots. Here, that’s not the case, so we thought ‘how do we use what we have?’ Instead of putting up a big fence and having it be just our space…we explored what commonality means by sharing this art outside. We are always reforming, we have this sense that God is calling us to new things. We looked at the space around Luther Place and we realized that some people will never come inside our church, so how could we honor the outside of it? How could we reach others? By a Sacred Commons. “Sacred” in that it’s holy ground, “Commons” in that it’s held in common by anyone who comes through. It’s also “sacred” in the sense that all people are sacred or children of God, and “common” in that we have the possibility of finding new ways to share and live in common. We need places to practice what that means. When we looked at our space outside, we chose to include art, beauty, even large plantings of sunflowers (which were very popular). Then we added these murals. The first one was Saint Francis of Assisi; the new one is of Dr. King. Also, public art is political in the best sense; it’s the art of the possible! What is possible for the church is that we bring forward those parts of church history that are about wholeness and what is possible for the human family. That we learn from saints like Saint Francis or Martin Luther King. We had these abandoned doorways that we weren’t using. I thought it was a great opportunity to bring some beauty to that space. I love murals! They certainly add something to the neighborhood. What about your other, first mural? We were thinking about who is in the neighborhood around Luther Place. We noticed a lot of people who have dogs walk them near us, so who better to depict than Saint Francis? We were trying to build a sense of community with that mural showing Saint Francis with this great Dalmation who actually belongs to one of our members. What does your congregation think of the mural? People are thrilled because it matches with our congregation…we are a place of hospitality. I think it’s a really good match. The congregation is happy to be able to offer our door for something like this. Amanda Weber is the artist, she works at Luther Place, so there’s also this sense that this is someone who knows our congregation’s story, knows this place, loves this place, but also wants change and social justice. These murals are from an artist from among our community. Tell me more about Luther Place and social justice. This is a congregation that speaks frequently about social justice, especially about homelessness and poverty. There’s our ministry with N Street Village, the Steinbruck Center for Urban Studies, a hostel in the church where we have groups come and stay from colleges–another group is coming next week. We facilitate spring break volunteering with different social justice projects about the reality of urban poverty– that’s an ongoing thing. We also participate in the Washington Interfaith Network…we do congregation-based, community organizing through WIN! The issue for us is, how do we not just talk about social justice but engage in the walk to change things. That’s partly why we used this outdoor space in a city to create what is beautiful; art and gardening can build community and help engage around justice in an urban place. You’re in a very special location. This is a neighborhood that had a lot of activity with prostitution and drug dealing before gentrification happened in the late 90s. I think it’s a challenge to look at what that means for our community. Gentrification has two sides to it: one is there are lovely new businesses that are arriving, you can get coffee or a good lunch, but the other side is that there are people and older businesses being displaced. Luther Place's second mural, featuring "Saint Martin of Birmingham", watches over 14th street. Before this week, if you had asked me where “Luther Place” was, I would’ve looked at you blankly, despite the fact that I’ve lived here since 1999. Shame on me, for that. Luther Place Memorial Church sits on Thomas Circle; it’s a brick building you’ve probably passed dozens of times if you walk, bike or drive on 14th street NW. 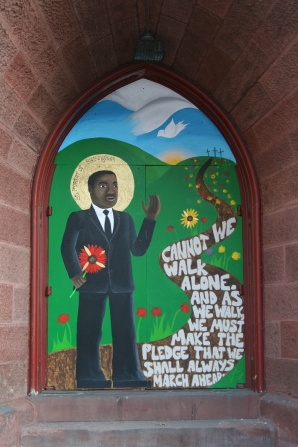 This week, the congregation dedicated a special mural featuring “Saint Martin of Birmingham”, or the Rev. Dr. Martin Luther King, Jr. I spoke to Reverend Karen Brau yesterday about this new piece of public art, her congregation and its history in this city. Tell me about Luther Place. It’s a congregation that has been part of this city since the 1870s. In the 1960s, when riots happened on 14th street, we were called to open our doors and be a refuge for people at that time. Now we have a ministry for homeless women that serves over 800 women a year with shelter, job placement and help with recovery from addiction. The congregation made the decision to open the doors of our church, and it became a point of sanctuary for people who needed a place to stay. Luther Place also became a distribution point…other congregations from different parts of the city brought food to us that could be shared with people being affected by what was going on at that time. I think that act was a turning point; in the words of the gospel, you should love your neighbor, care for a stranger. Those words came to life in a very palpable way. And not everyone could deal with that, so that defined the congregation too. What do you mean by people not dealing with it? The city was burning. Some people thought, “I live far away, there are other churches in my neighborhood”…those were good excuses. At that point a fair amount of our congregation had moved to the suburbs. So a defining moment for our congregation as a whole became a defining moment for some of the people in it, too. They hadn’t necessarily seen themselves as activists, but when invited by their pastor, they stepped right in. That situation changed people’s lives in a very important way going forward…and that’s part of why it makes sense to have (MLK) on 14th street. 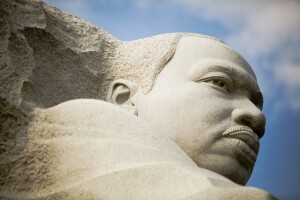 We wanted to do something on 14th st. We knew its history with the riots after Dr. King was assassinated and the burning that went on along the 14th street corridor…so to us it seemed very logical that the icon who should look out on to that street would be Martin Luther King, Jr. If an icon is someone we venerate as holy and a saint, then we feel that he is just that because of his walk with God and his witnessing. I like that you call him Saint Martin of Birmingham. It appeals to the erstwhile Catholic School student within me. Next: the rest of my interview with Rev. Brau, including more on social justice, gentrification and who posed for Luther Place’s other, first mural of Saint Francis of Assisi.